Laxfield appears in the Domesday Book and in 1226 was given a charter to hold a Saturday market. 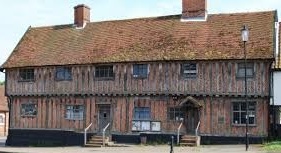 It was the birthplace of the infamous William Dowsing – the village and the surrounding area, like much of East Anglia, was a hotbed of Puritan sentiment during much of the 17th century. Laxfield was the final station on the Mid-Suffolk Light Railway, which ran from the Great Eastern Railway line at Haughley. The railway opened in 1904 and eventually closed in 1952. Mid-Suffolk Light Railway It has a significant Museum housed in a beautiful medieval Guildhall.